Through Trinity College Bristol’s new dispersed learning track, ordinands have the option to train at Trinity without moving home. Dispersed learners can complete the Diploma in Theology, Ministry and Mission in two years or the Bachelor of Arts (Honours) in Theology, Ministry and Mission in three years, both accredited by Durham University. Trinity’s dispersed learners attend college for six block weeks during the academic year, during which they attend seminars, spend time in reflection, build community within their cohorts, and engage with the residential Trinity community. 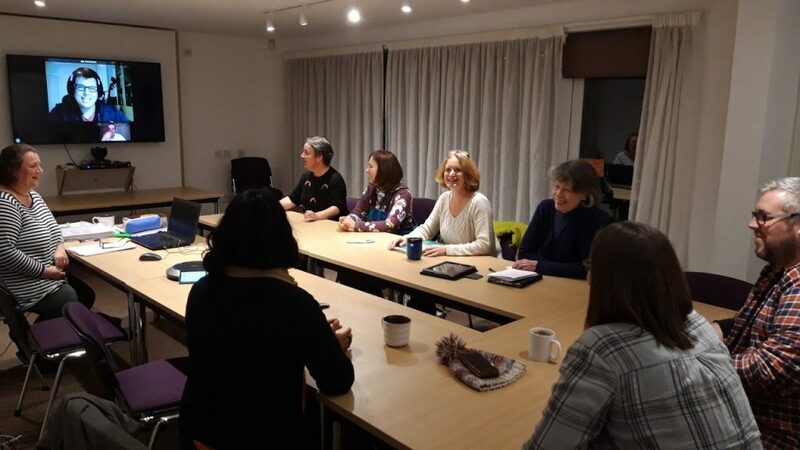 Between block weeks, dispersed learners log into a weekly virtual tutor group and seminar (pictured above), which offer additional support for learning in context and formation. This new track builds on Trinity’s expertise in contextual training, emphasizing close integration between the student’s context and the college. The college connects regularly with each student’s church supervisor to help ensure that the training experience remains a holistic one. ‘We want to enable supervisors to partner with us in ministerial formation,’ says programme director Revd Sue Gent. Trinity offers support and training for its students’ supervisors, and supervisors will be aware of the students’ academic modules so they can help students integrate their studies with their ministry experience. ‘The balance of context engagement and study is designed to facilitate a high quality rigorous academic programme integrated with contextual engagement,’ explains Revd Gent. For further information about beginning a programme at Trinity College Bristol, contact admissions@trinitycollegebristol.ac.uk or 0117 968 0254. This blog hosts a collection of voices, some from within the Trinity community and others from beyond it. Although all opinions are each author’s own and cannot necessarily be considered to represent Trinity’s position, our prayer is that you will be inspired, informed, and challenged through your engagement with our bloggers. If you would like to receive Trinity's e-newsletter four times a year, please email m.stratis@trinitycollegebristol.ac.uk with your full name, and we are happy to add you to that mailing list.